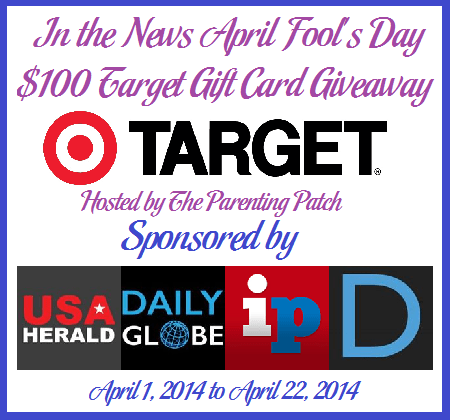 Welcome to the In the News April Fool’s Day $100 Target Gift Card Giveaway sponsored by the USA Herald, the Daily Globe, Indyposted, and the Daily Digest and hosted by The Parenting Patch. Keeping up with the news is no joke. Unfortunately, busy parents often do not have the time to sit down a read a newspaper each day. The USA Herald, the Daily Globe, Indyposted, and the Daily Digest are here to help. Each news site offers a slightly different view of the news happening around the world each day. Plus you can stay up-to-date from your computer, smartphone, tablet, or other mobile device! Shopping time is here! Winning a $100 Gift Card to Target is such a great bonus to any budget! This is awesome of them. One lucky reader of The Parenting Patch and Tales From A Southern Mom will win one (1) $100 Target gift card compliments of the USA Herald, the Daily Globe, Indyposted, and the Daily Digest. To enter for your chance to win the In the News April Fool’s Day $100 Target Gift Card Giveaway, simply use the following Rafflecopter form. Be sure to stop by each day to claim your daily entries. Good luck! The In the News April Fool’s Day $100 Target Gift Card Giveaway is open worldwide. An international winner will receive $100 minus any PayPal charges via PayPal in lieu of the specified prize. The In the News April Fool’s Day $100 Target Gift Card Giveaway ends at midnight CST on April 22, 2014. One winner will be chosen at random via Rafflecopter. The winner will be sent an email and will have forty-eight hours to respond. If no response is received within forty-eight hours, another winner will be chosen. The Parenting Patch and YOUR BLOG HERE are not responsible for prize fulfillment. Target is not affiliated with the In the News April Fool’s Day $100 Target Gift Card Giveaway. Previous post: RootBizzle Tie Club Giveaway!